I enjoy Dhaba food, esp, sitting on the cots and having garma garam food and lassi :), and one of my favorite is the parotta, which is served with some gravy or dal. Once me and my mom, observed the way the cook at the dhaba, works on the dough and tried at home, but it was never a success. Recently I have come across this blog here, which showed the step by step process. This has come out very well, just like the parottas, made by a profi. Oil: while kneading(1Tbsp) and while rolling(as needed). Mix all the dry ingredients in a big bowl and add eggs(if using). Knead to form soft dough adding sufficient water and oil. Cover with a wet muslin cloth and keep it aside for 1 hr. Divide the dough into equal portions of size of a small. Take a portion and apply some oil on it. On a flat platform apply some oil and roll out the portion to the maximum, as thin as possible and do not worry about the shape. Now fold it, just like making pleats of a saree, and roll it spirally. Repeat this step for all the portions. Heat the tawa, and roll out each portion in the shape of a roti and fry on hot tawa on both side, applying little ghee or oil. Heat oil in a kadai, and add the ingredients for Tadka. Add Onions and green chillies, and fry till golden. Add ginger garlic paste and haldi and fry for few more mins. Now add aloo and gobi and salt and cook covered for 10 mins. Add Garam Masala, and cook for few more mins till done. Garnish with corriander and serve hot! Nothing like the Parotta to make you feel all warm and cozy, yes the highlight of any long road trip. The aloo gobi looks tasty hmmm. ehmm…tamil nadu parotta is our all time favorite…my daughter likes this with paneer butter masala…both are looking yummy! I never had Porotta at a Dhaba before, is this served at Dhabas in South of India ? Should make it a point to vivt if I am down there. Cinnamon… you got such perfect looking parottas. My dad makes these very well but from what I’ve seen it’s very time-consuming and uses a LOT of oil so never really attempted it. But your recipe only uses 1 tbsp – that’s very good! i so agree with you on dhaba food – my husband’s a big fan of parottas. I truly agree with u Spanz, Dhaba food is so tasty and filling and with common ingredients. It seems you have quiet easily mastered the layering technique. me too make like this..But the original method is too hard than this..So I ended up making like this..love this with green peas or chicken..
I’ve never made this…looks so beautiful. Wow…this is really kewl!! i m making it this weekend. Wow, you made layered parottas… That is awesome… I have to try these too, I absolutely love parottas but have been depending on the super oily frozen ones to satisfy the cravings… Time to take matters into my own hand… Yours look perfect! ISG, ya, parotta is very comforting! Valli, paneer butter masala, make a great combi with parottas!! Sandeepa, yeah, this is famous in Dhabas in SOuth India.. a must try!! Pooja, try it, and do let me know, how it came out!! Thanks for the great looking gobi and paratha. Wow! your parotta looks so professional…too good! and the combo rocks! 🙂 Can the parotta be made with wheat flour too ? Mishmash, ya adding egg to the batter, gives a good result! Tee,u can mix maida and wheat flour in 2:1 combination. But only wheat flour does’nt give the good result. the layers look like they would just melt in your mouth, really yummmmmm. I tried this parotta once but it needs a lot of oil right. 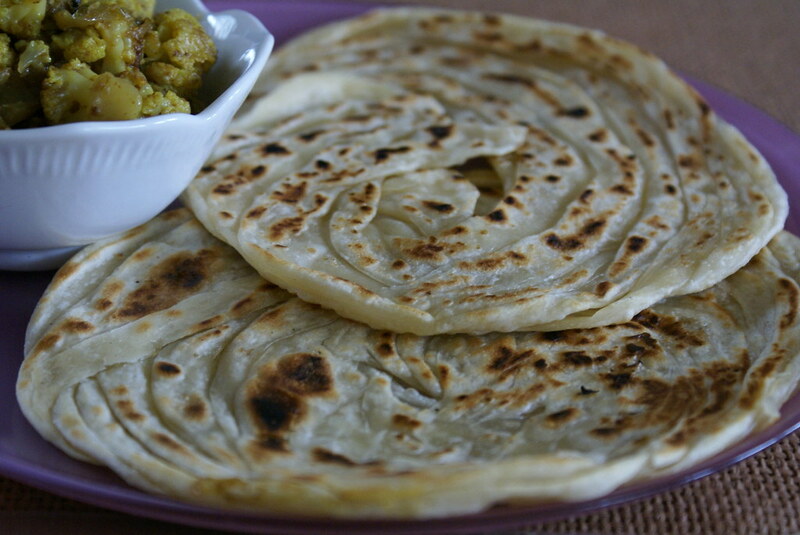 I love this parotta, your gobi pics look soooooo yummmmyy!! make me drool! OMG, YUM!!! Your parotta looks sooooo flaky and soooo good. I am drooling like crazy, and I LOVE Aloo Gobi!!! I’m drooling over ur parotta…i like parotta with spicy chicken curry(kerala style)…. That is one perfect layered parotta!!! Love the combo of parotta & subzi! dhabba style! when you look at the pros you think it is so easy…then you go home and try it out..and well..you realise that it is an utter flop!! happened to me a couple of times :)..love the parotta and it looks like a pro made it too..
Wow. Just wow. This recipe is in my to-do list for months now. Vineela of Vineela’s cuisine tried and posted about this. It was then I bookmarked it.. Hmmm.. Someday. 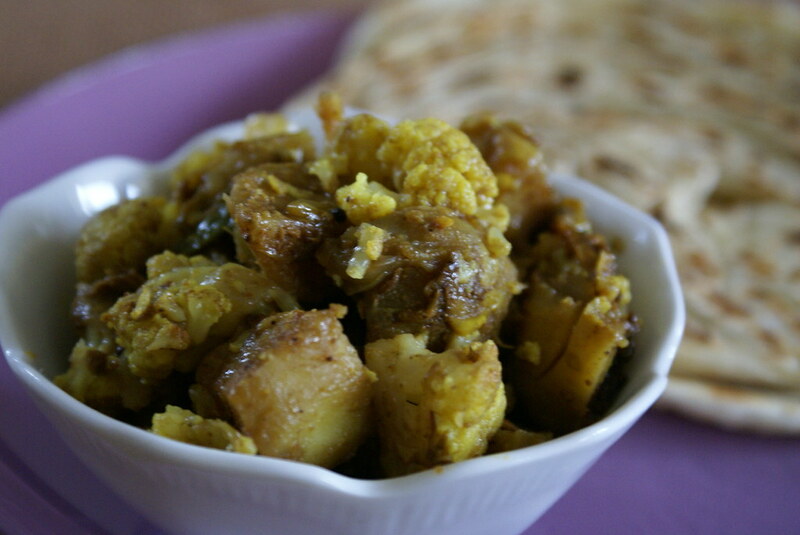 wow, nothing like that parotta and aloo gobi on a cold day. Looks fabulous! i always thought that making layered parathas was a tedious job! gotto try this now ! Thanks for sharing. Hey.. Have a story to share, without worrying about revealing urself ?.. Tell it to the virtual world… let the world know your story but not your identity. 🙂 http://www.project71.com/readme Enjoyy! The Porottas look so good. After having frozen ones I am sure this is a welcome change. I am not a fan of long time consuming things, but this is an exception. have to try it . It’s totally, totally worth it and yours came out perfect. Me too, love dhaba food. I will also try to make them. Your parotta reminded me of the ones I used to have at my mom’s place. We had a cook who made this so well. Now I don’t have any contact with her. I’ve always thought that if I ever see her again I should get the recipe. Anyway, I was happy to see yours. Thanks for sharing this.Aloo gobi looks great too. wow i loved the way u made the parotas layered. nvr heard. will try urs soon. book marked it. gr8 pics too. 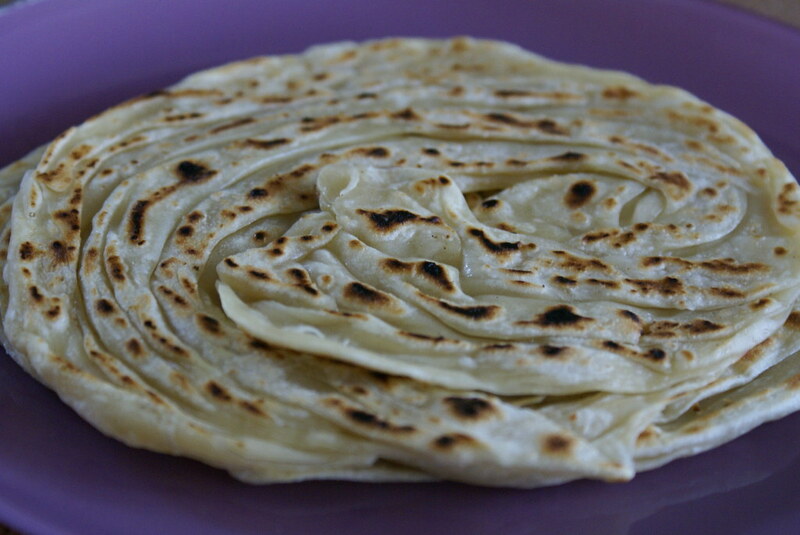 parotta………hmmmm mouthwatering. Nice to see the recipe have to try out. hmmm! good on you! I am yet to reach this stage of making parottas..some day I will!! mine always turns hard..chapatis or any of its siblings!! !